That causes all kinds of problems for street safety advocates. Flusche said the lack of good data can make safety comparisons difficult. Two cities, for example, with roughly the same population and the same number of cycling fatalities might appear to offer similar safety outcomes. But that would clearly be misleading if one city had a far higher rate of cycling. It can also present problems when trying to make the case for bike lanes and pedestrian safety improvements to, say, a local business. It’s a lot easier to present a convincing argument when you have solid numbers about how many people will be making use of the new infrastructure. The state of bike/ped data may soon improve. For the first time this year, the Federal Highway Administration has issued recommendations for “non-motorized” groups in its Traffic Monitoring Guide [PDF]. States and localities still have to want to collect data — there’s no one forcing them to do it — but this will be the first time that the “bible” for traffic counts even contemplates cyclists and pedestrians in its guidance. The guide sets out to help agencies decide what method is best for their purposes: manual or automatic counters, long or short-term measurement periods, and so on. It also advises transportation professionals about how to interpret the data — which, given the limited information currently available, has been very difficult to do. 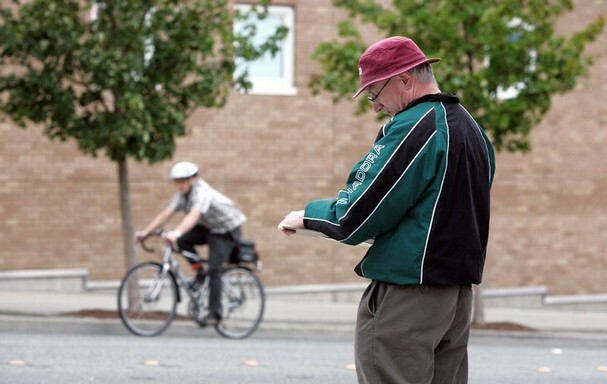 For example, if your community’s bicycle counts consist of volunteers counting in a two-hour period at select locations once a year, is that necessarily representative of the universe of cyclists in the region? How do time of day, weather, location, and other factors influence the counts? The answer, right now, is that researchers aren’t too sure. “The systematic monitoring of pedestrians and bicyclists is still an emerging area that requires more research,” the guide’s authors write. Meanwhile, the Transportation Research Board is taking a look at the same issue. The TRB has commissioned a guidebook for transportation planners to help forecast how different development scenarios would affect levels of walking and biking activity. That would be “so many steps forward from what we have right now,” said Flusche. Currently the best available data on walking and biking comes from the American Community Survey and the National Household Transportation Survey. The problem with the ACS, Flusche says, is that it doesn’t measure all types of bike trips, it only estimates how many people are commuting by bike — and even then, only those who commute by bike at least three days a week. The Household Travel Survey also has some limitations. It is expensive to administer and conducted very infrequently. In addition, small sample sizes make it difficult to break down results by geographic area. Better measurement tools are especially important because the new transportation bill, MAP-21, emphasizes “performance measures” in selecting projects for federal funding. Having a weak sense of how many people are actually biking and walking makes it difficult to build a strong, data-based case for increased investment in infrastructure to support those activities. I wonder if there are any bicycling industry statistics; bikes sold in the United States. Seems like increasing bikes sales would be a gauge for the number of bicyclists. Obtaining good bicycle metrics would be a reason for registering bicycles and demonstrating the need for more bicycle infrastructure. @p_chazz:disqus Wrong, but nice try with the anti-bike trolling there. It makes no more sense to justify registering bicycles for want of demonstrated demand for bike infrastructure than it does registering walking shoes for want of demonstrating need for sidewalks. @Erica_JS:disqus Yes, this is in regular practice in San Francisco. @Erica_JS:disqus that type of setup is frequently used to measure turning movements too, or to get a breakdown of how many cars are in each lane. It would seem like it could be adapted for counting bikes pretty easily, though it’s much easier for a cyclist to avoid the hose or not hit it hard enough to trigger a count. One advantage that cycling has over driving, in terms of counts, is that many people record/track their rides. Also, what about working with transit agencies? For example, in the SF Bay Area, does Caltrain track bike boardings on its trains? Does Muni or GG Bus/Ferry? That might at least help with a count/trend of ridership (obviously it misses non-multi-modal commuters). None of this helps with pedestrians, but it is a start for bikes. @Erica_JS:disqus Yes, There were traffic counters in the bike lane only on a couple spots near the SFO airport earlier this year. What makes you think I’m trolling, Mom? Don’t know why you are so averse to the idea of registration. Seems like it could provide useful metrics. As for shoes, there is pretty much a one to one correspondence between pairs of shoes and the census. Uhh, where is the mention of the National Pedestrian and Bicycle Documentation project? It is an ITE project that they did with Alta Planning and Design. Lots of cities use it. @p_chazz:disqus The reason that it looks like you’re trolling is that car-like mandatory bike registration is often brought up by people with an anti-bike agenda, typically without much apparent reasoning except spite (“if we drivers have to do it, so should theyyyyyy”). The number of people that own a bike is not all that useful a statistic (you really need much more detailed numbers for deciding public policy), and certainly wouldn’t be worth the huge overhead and legal murk of a mandatory registration system. No mention of bikeshare in this. The bikeshare in DC collects anmd makes available data on the use of its’ bikes. This is a source that covers a limited number but does it extensively as bikeshare operates year round. As Danmaceda said, the Capital Bikeshare does an excellent job of collecting data, and it is available on their website. I recently talked with some of the people working the system and data has been cruciaal in its success and continued expansion. It’s not perfect, but it is doing a lot to further the bikeshare as well as the infrastructure in D.C. and the surrounding communities! This is good news. I remember when I wrote about the relative amount of space given to bicyclists in NYC, that 1) I found that even with a relatively low rate of cycling, bicyclists still had much less space per rider than cars, and 2) that the reported cycling rate was shockingly low: below 1%. Digging into the info a bit, it seemed like all they really counted was people traveling over the bridges into Manhattan. How can you count just the travel into one borough, and no travel within any of them, and even pretend that it’s going to be anywhere near accurate?